Need an easy, freezer-friendly breakfast that is homemade and will keep your kids full of energy for a busy school morning? 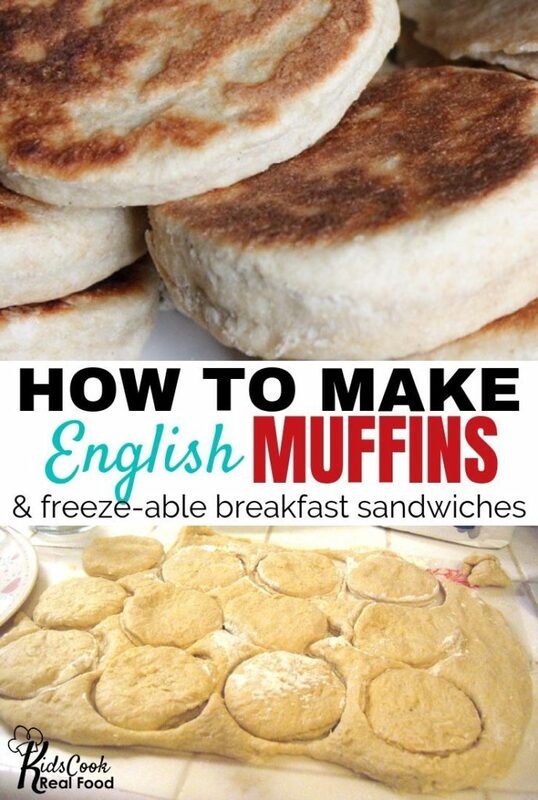 Teach them to make homemade English muffins and then add bacon and eggs…mmmm! These homemade English muffins are so easy even kids can make them! They are a “special treat” in our house because we rarely have gluten at all and especially not white flour (they’re half and half) but they’re still so much better than commercially produced bread of any kind. And for real – the way they make the house smell is worth any time put in! Plus of course…when we empower kids to make their own food, we build confidence and show them how important they are in the world by giving them important jobs in our family household! Check out this hilarious many-part video for how we make them using techniques we teach in Kids Cook Real Food! 0:15: The first step is to soak the whole wheat flour to reduce the phytic acid. See more about why we soak grains here. 0:29: We grind our whole wheat flour. 1:53: Watch as we prep our flour for soaking by mixing in the wet ingredients, stirring to produce a uniform mixture and covering to sit overnight. 3:01: The next day…we mix up the rest of the dough. 4:40: The kids kick me out of the kitchen to finish this recipe on their own! 5:32: Here’s a tip! Cut out your English muffins with a metal canning jar lid. 6:04: Our English muffins are ready to be cooked! 6:35: You can use these to create sandwiches for breakfast or lunch, toast them or make tiny pizzas. They freeze really well so you can have a quick breakfast on hand. 9:46: We end with some bloopers from filming this episode! Enjoy! First we will soak our whole wheat flour overnight. Combine whole wheat flour, milk, yogurt and warm water to create a uniform mixture. Cover your bowl and leave it to sit on the counter at room temperature overnight. The next day, sprinkle the salt and yeast all over the top of your dough. Add honey. Pour the hot water around the edges of the bowl so you don’t kill the yeast. Stir to combine into a uniform mixture. Cover and let sit in a warm area for an hour. You should see bubbles forming in your dough. Mix in butter and white flour. Kneed until combined. Sprinkle cornmeal on your rolling surface. Roll your dough to about 1/4 inch thick and cut into circles. Preheat your gridle (don’t forget the sizzle test!) on medium heat and cook the English muffins for about 2 minutes on each side. They’re ready to flip when the bottom is getting golden brown. If the middles need longer to cook, you can turn the stove down to medium-low so you don’t overcook the outsides. Slice in half and enjoy! These make great little pizzas or breakfast sandwiches with an egg, cheese and sausage or bacon.